1. The chinchilla is a nocturnal mammal, meaning that it likes to stay up at nighttime and sleep during the daytime. 2. A chinchilla’s typical lifespan lasts for about 15 years. However, if they are taken care of either as a pet or in captivity, their lifespan can be as long as 20 years. 3. Chinchillas grow to be about 12 inches long and they can weigh between 19 and 20 ounces when they are fully grown. 4. The chinchilla is native to South America, mainly in the Andes Mountains where there are many places to hide from predators. 5. 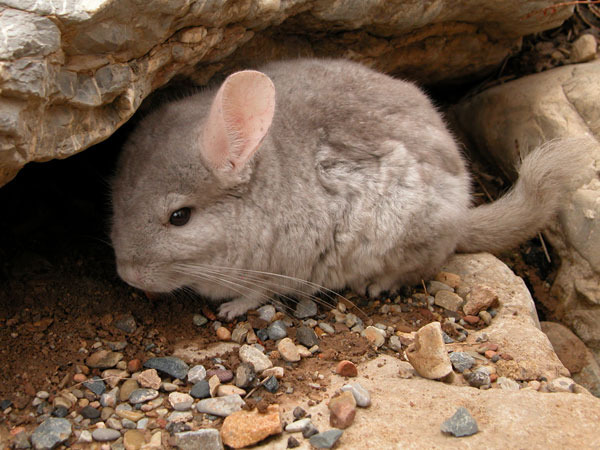 The main predators for chinchillas in the wild include wild dogs, snakes, skunks and large birds. 6. Chinchillas have two main defenses they use when they are attacked or threatened. They can spray urine on their potential attackers, for one. And if a predator grabs them, they can shed that section of fur (called a fur slip) so they can get away. 7. Pet chinchillas generally survive on a diet that consists mostly of hay. But chinchillas in the wild have a diet that includes fruits, small bugs, and plants. 8. A group of chinchillas is called a herd. 9. The chinchilla population has drastically declined in recent years, mainly because man has hunted this little creature for its fur. While it is illegal to hunt or trap chinchillas these days, it is still done in order to get fur to make fur coats from it. There are also chinchilla farms where these small creatures are raised for the sole purpose of slaughtering them for their fur. 10. Chinchillas are designed to live in high altitudes as their red blood cells can carry more oxygen than the red blood cells of other animals in the same family. 11. A chinchilla can jump as high as six feet! 12. Chinchillas are not picky about their sleeping positions. They can sleep upright, on their sides, or even upside down. 13. A chinchilla communicates through a variety of sounds, including squeals, barking sounds, grunts and chirps. 14. The chinchilla’s digestive system uses a process known as caecotrophy. This involves digesting the food one time, excreting it, and then ingesting it again so it can be digested a second time. 15. Chinchillas enjoy spending time with each other as they are very sociable animals. When they are in the wild, they will often gather with as many as 100 other chinchillas. 16. Of all land mammals, the chinchilla has the softest fur. They have between 50 and 80 hairs that grow out of each individual follicle. To put that in perspective, humans only have between 2 and 3 hairs growing out of each individual follicle. 17. A chinchilla’s fur is so thick and full of oils and dirt that they take dust baths. Instead of water, they use dust baths to make themselves clean. They will also roll around in the dust while they are bathing. 18. By the age of 8 weeks, chinchillas are sexually mature, right about the time they are ready to start weaning. 19. Compassion is a common trait among chinchillas. For example, if a female chinchilla cannot produce milk for its babies, another female chinchilla will adopt the babies and take care of them. Male chinchillas will also babysit the babies if the female is out feeding. 20. Many people enjoy keeping chinchillas as pets because they do not have any dander, which is often the most cited reason for pet-related allergies. 21. Chinchillas are very playful. If you have one as a pet, you should provide them with a large cage and plenty of toys to keep them busy and active. 22. A chinchilla’s teeth continue to grow throughout their life. They need to chew on sticks often to help wear down their teeth so they can easily feed. 23. Chinchillas can breed at any time of the year, but their peak mating season is between November and may. 24. A female chinchilla’s gestation period lasts for about 111 days, nearly 4 months. 25. A baby chinchilla is called a kit. When giving birth, the female chinchilla gives birth to a little that ranges between 1 and 5 kits.